Claude our favorite French dog, but is he really? We read our first Claude: Claude and the City about three years ago as an inspired librarians had displayed it with a bunch of other books recommended for early readers. I suspect my daughter, who was then 5, picked it up partly because it was long enough to look like a paperback, which to her was what grown ups read, so something she should aspire to. But this random pick turned out to be a great discovery for the two of us! After all what’s not to like about a smart and cheeky dog, who loves cakes and wears a stylish red beret?! So when my son picked up Claude at the Circus on a recent visit to our local independent bookseller, it was like being re-united with an old friend.C. particularly loves Claude’s sidekick, Mr Bobblysock, who may smell a bit like cheese but who can always be relied on in an emergency. I love the retro feel of Alex T. Smith’s illustrations and the humour of his books. For some reason (maybe the colour palette) they remind me of Ian Falconer’s Olivia, another quirky and cheeky character. 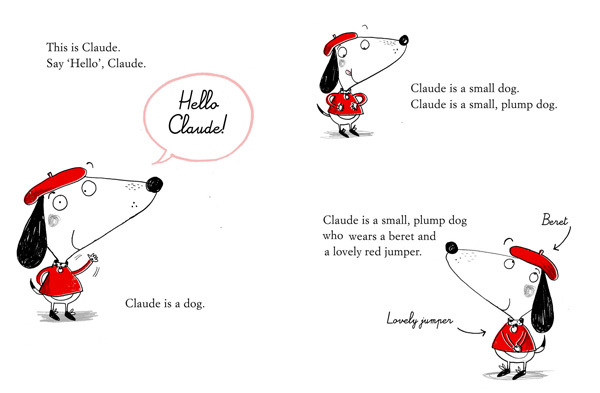 To me, all the Claude books are a delight to read aloud, and it is fun to see how little people instantly recognize his knowing grin when he thinks about lovely buns or pretends to be asleep after he’s come back home just on time to fool his owners, Mr and Mrs Shinyshoes. As to his French flair, what can I say?! I am biased! He wears his red beret with elegance and uses it as a fantastic stash for things he needs. He can tap dance but does not like to stretch much. 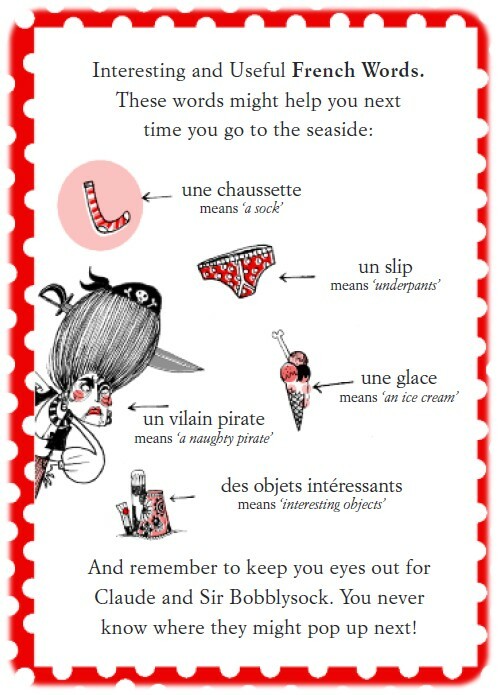 And he loves a good cup of tea and a nap in the park, two of my favourite things… So if you need to polish your French before your next holiday or if you’d like a good laugh, go to your library or buy one of Alex T. Smith’s Claude books, I promise you, you will not regret it. Want to know how to draw Claude? Follow this easy tutorial! Want to polish your French? Why go for Berlitz or Lonely Planet when you have Claude’s essential phrasebook? Finally British Readers, next time you’re stuck for ideas when your child asks you for a costume the day before World Book day: think Claude! Red beret (which can be knitted in an evening, I swear) red sweater and you’re good to go!